Scientists and doctors have made tremendous advances to make tissue regeneration a reality in treating many diseases. Through regenerative medicine a person can take advantage of their body’s ability to heal itself by using the healthy adult stem cells that can be found throughout the body. Laboratory and clinical research has shown that it is possible to use adult stem cells to restore lost, damaged or aging cells and effectively regenerate tissue in the body. Providing patients with an alternative to surgery for certain treatments. Regenerative therapies are showing promise in orthopedic medicine, burn treatment, nerve restoration, and treatment of heart conditions, diabetes, multiple sclerosis and other diseases. Adult stem cells were discovered over 40 years ago when researchers found that cells derived from bone marrow had the ability to form various tissues. Adult stem cells are early stage cells and under the right conditions, are capable of developing into other types of cells with the potential to regenerate damaged tissue. • A person who understands that surgery sets off a cascade of further degeneration, and is prepared to benefit from the body’s own regenerative mechanisms. Every patient is different and the success of the stem cell therapy is dependent on the severity of your condition and your body’s response to stem cell therapy. • This mechanism uses adult autologous stem cells, derived from your own bone marrow. • In the procedure, the physician will aspirate these cells from your hip, concentrate them, then deliver them back into your body in the area of damage or injury to aid in natural healing. • In all, the process takes less than 45 minutes and the concentration of the cells takes about 12-14 minutes. • Because your procedure will utilize a concentrated serum of your own cells, the procedure is considered “autologous point-of-care”. Once the procedure is complete, our staff will allow you to rest and your physician will create a customized personal rehabilitation program for recovery. We will either ask you to come back for a few post-operative appointments or follow up with you by phone, email, or mail so we can track you healing progress. Q: What is Regenerative Medicine? A: Regenerative Medicine is a new and advancing scientific field focused on the repair and regeneration of damaged tissue utilizing stem cells. Q: What are adult stem cells? A: Adult stem cells are unspecialized or undifferentiated cells, capable of two processes: self-renewal and differentiation. They are vital to maintaining tissues in the body such as internal organs, skin, and blood. A: Yes, there are many types of adult stem cells found in the body, which have variable differentiation potentials. 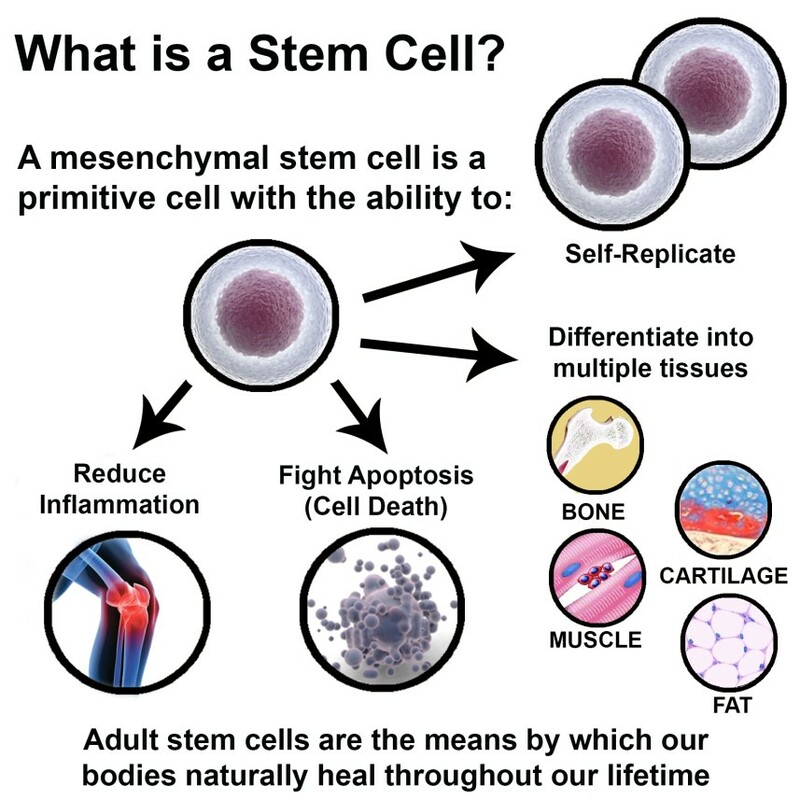 The adult stem cells that aid in the repair of damaged tissue are multipotent, mesenchymal stem cells. These are located in bone marrow and adipose (fat) tissue. A: In adults, stem cells are present within various tissues and organ systems, the most common being bone marrow and adipose or fat tissues. Other sources include the liver, epidermis, retina, skeletal muscle, intestine, brain, placenta, umbilical cord and dental pulp. Q: What is the difference between adult stem cells and embryonic stem cells? A: Adult stem cells are found in mature adult tissues including bone marrow and fat, while embryonic stem cells (ESCs) are not found in the adult human body. ESCs are obtained from donated in vitro fertilizations, which raises many ethical concerns. Because ESCs are not autologous, there is a possibility of immune rejection. Adult stem cells do not raise ethical issues nor pose any risks for immune rejection. Q: Does Dr. Kominsky use embryonic stem cells in clinical procedures? A: No, Dr. Kominsky’s cell therapy systems uses only autologous adult stem cells isolated from the patient during surgery. He does not participate in embryonic stem cell research or use embryonic stem cells in clinical applications. Q: Are there ethical issues associated with harvesting adult stem cells? A: No, adult stem cells do not raise ethical questions as they are harvested from the patient’s body. Q: Are there cancer-causing risks associated with adult stem cell treatments? A: No. Where embryonic stem cells have been shown to form teratomas (germ cell tumors), there is no data that suggests adult stem cells have the same potential to promote the development of tumors. Q: How does Dr. Kominsky obtain adult stem cells for use in cell treatment? A: Dr. Kominsky currently has a system that uses adult stem cells from bone marrow and these stem cells are obtained through aspiration during your procedure. Q: Are the harvested adult stem cells expanded in a laboratory setting prior to delivery back to the patient? A: No, Kominsky does not use in vitro expansion. The cells are harvested, processed in the operating room and delivered back to the patient at point of care. Q: How are adult stem cells used in surgical procedures? A: Adult stem cells are used to treat patients with damaged tissues due to age or deterioration. During a procedure, stem cells are isolated from the patient, concentrated and delivered back to the site of injury to assist in the healing process. A: The differentiation of stem cells is dependent on many factors, including cell signaling and micro-environmental signals. Based on these cues, stem cells are able to develop into healthy tissue needed to repair damaged tissue. For example, multipotent stem cells delivered to damaged bone will develop into bone cells to aid in tissue repair. The exact mechanism of lineage-specific differentiation is unknown at this point. A: No, adult stem cells are autologous and non-immunogenic. Q: Where are stem cells currently being used? A: Stem cells are currently being used in both laboratory and clinical settings. Laboratories are using human and animal derived stem cells to conduct in vitro studies as well as in vivo studies with small and large animals. Autologous adult stem cells are currently being used in hospitals and clinics during surgery to aid in the repair of damaged tissues. Q: What is the difference between autologous and allogeneic cells? A: Autologous cells are taken from the same patient, typically at point-of-care. Allogeneic cells are taken from another patient and are often manipulated before they are given to another patient. A: Autologous cells are taken from the same patient, typically at point-of-care. Allogeneic cells are taken from another patient and are often manipulated. A: Most insurance will not cover stem cell procedures. Ask your doctor for payment options.